Fiat Chrysler Automobiles scored big this model year when the company announced high-performance Hellcat versions of both the Dodge Challenger coupe and the Dodge Charger sedan. 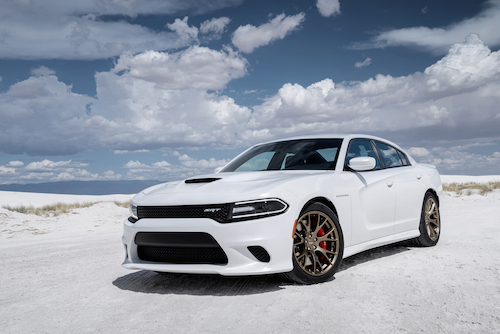 The two Hellcat models are powered by a supercharged 6.4-liter, V-8 engine making 707 horsepower, a previously unheard of number for a production car. As soon as FCA announced the new vehicles, customers responded by placing orders for them. However, customer interest was far greater than what FCA anticipated and by March the automaker quit taking orders as it wasn’t able to keep up with demand. Most people who ordered one should be able to get a 2015 model, but others may have to wait for production to resume for the 2016 model year. So, why did Dodge begin to run commercials this weekend advertising models that are not available? That decision may seem curious as a pair of “predator” commercials began airing Sunday in 30- and 90-second spots, and were telecast on major sports and entertainment channels, including TNT, TBS, and Discovery. In the commercials, Dodge played a recording of Phil Collins singing, “In the Air Tonight,” as both models plus the Viper GTS demonstrated street prowess. In a recent brand restructuring move, FCA made changes that recast the Chrysler marque as a mainstream brand and Dodge as a performance make. The transition is not complete as new and updated models come to the market, while others are discontinued, such as the Dodge Grand Caravan minivan. Besides Viper, Charger, Challenger and the Grand Caravan, Dodge also sells the midsize Journey crossover utility vehicle, a Durango SUV, and a compact Dart. A performance Durango R/T model powered by a 5.7-liter, V-8 engine making 360 horsepower is currently available. A high-performance Dart SRT variant is also in the works, but that model seems delayed. Even so, the Hellcat commercials are designed to get customers to consider other models as the Hellcat halo overshadows them. Before the commercials began to run, Dodge was seeing mixed interest in the brand. Dodge sales are down by 16 percent this year, but nearly the entire loss can be attributed to the discontinuation of the midsize Avenger. FCA decided to give the Chrysler brand an all new 200, but left Dodge without a similar model. Dodge Grand Caravan sales have plummeted too as customers continue to move away from minivans to crossovers. Among the biggest gainers for Dodge is the Challenger as sales continue to rise for the year. Specifically, Challenger sales are up 41 percent on volume of 37,011 units sold through the first six months of the year. Moreover, the Dodge Challenger is closing in on the second-place Chevrolet Camaro and its 42,593 units sold (down 8.7 percent). The Ford Mustang leads the pony car segment on 68,290 vehicles sold (up 54.4 percent). Dodge Charger sales are also up a modest 2 percent through June 2015. Dodge Dart sales are also surging and are up 29 percent on 49,055 units sold for the year. However, this compact model has fallen far short of the company’s sales projections and is selling in numbers that are less than one-third that of competing models such as the Toyota Corolla and the Honda Civic. If you really want a 2015 Hellcat you may have to pursue a less conventional path to vehicle ownership. At the same time Dodge was airing the commercials, eBay Motors was featuring new and used 2015 Hellcats. Pricing for the Challenger Hellcat begins at $59,900, but the “buy it now’ price was coming in at upwards of $20,000 above the base sticker price. Media courtesy of Fiat Chrysler Automobiles.